Room with a double bed or two twin beds, overlooking the elegant shopping area or the hotel' s inner courtyard with garden.The room overlooking the main street may dispose of a balcony. It is equipped with all the modern comforts: air-conditioning, heating, minibar, safe, LCD tv, direct phone, wifi connection, bathroom with shower, hair dryer. 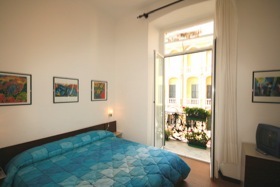 Room overlooking the main street that may dispose of a balcony or the hotel's inner courtyard with garden. it is equipped with all the modern comforts: air-conditioning, heating, minibar, safe, LCD tv, direct phone, wifi connection, bathroom with shower or bath-tub, hair dryer. Room for three people consisting of a double bed and a single bed. Upon request it can be prepared with three single beds. It looks over the main street or towards the inner courtyard with garden. It is equipped with all the modern comforts: air-conditioning, heating, minibar, safe, LCD tv, direct phone, wifi connection, bathroom with shower, hair dryer. Large room for three people, consisting of one double an one single connected rooms, with two bathrooms. It enjoys a pleasant view over the main street and may dispose of a balcony. It is equipped with all the modern comforts: air-conditioning, heating, minibar, safe, LCD tv, direct phone, wifi connection, bathroom with shower, hair dryer. Room for four people, overlooking the inner courtyard with garden, consisting of a double bed and two single beds. It is equipped with all the modern comforts: air-conditioning, heating, minibar, safe, LCD tv, direct phone, wifi connection, bathroom with shower, hair dryer. 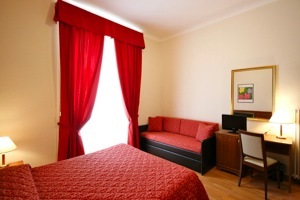 Simplier furnished room, not equipped with air-conditioning, minibar and safe, it offers good value for money. It overlooks the main street and may dispose of a balcony or the inner courtyard with garden. It is equipped with heating, fan, tv color, direct phone, wifi connection, bathroom with shower or bath-tub, hair dryer on request.